This extra-large seashell shaped pasta is used for stuffing and oven baking. 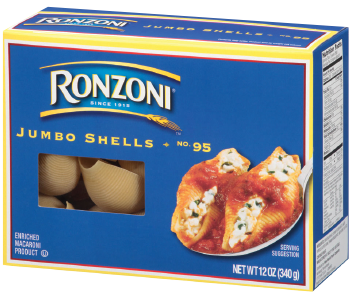 Jumbo Shells are undercooked, then filled with cheese, meat or vegetable fillings, covered with sauce and oven-baked until pasta is done. Jumbo Shells make a great entrée for entertaining since dishes can be prepared ahead of time, covered and refrigerated 24 hours before baking. Available in 12 oz.